Shooting Review: The Glock 19 Gen 5 | Eagle Gun Range Inc.
Glock released the Gen 4 pistol line in early 2010, which addressed some caliber-to-frame durability issues and brought some mild external changes. Roughly seven years later we’re presented with the next generation in Glock’s lineup. The Gen 5 differences are equally mild on the surface, but there are some interesting changes that are not immediately apparent. I’ve been using my Gen 5 Glock 19 since late August and have put roughly 4,000 rounds through it since. I’ve run it for static precision and in dynamic defensive drills from concealment, with and without a light attached to the rail. I have also spent time with it disassembled, getting familiar with the internal changes and issues with parts replacement (since Glocks are fun hobby kits). Mostly, the Gen 5 Glock 19 is just a Glock 19, but there are some interesting and odd changes that warrant examination. There are also some caveats that early purchasers should be aware of. I hope to cover most of all of them here, but keep in mind that these insights are from less than 2 months of use, several times a week. More time may tell more tales. Much of this review will deal with Gen 5 differences from previous versions and Gen-5-specific user issues (for carry, shooting, accessories, etc…). For a more basic review of the Glock 19 I encourage you to read my Glock 19 Gen 4 review here (“Review: Glock 19 Gen 4 – After 80,000 Rounds”). Note also that the photos shown in this article do not depict factory-new pistols. Rather, these are photos of the pistols of someone who uses them hard several days every week. They tend to get a bit beat up. Why Consider the Glock 19 Gen 5? The first and best reason to consider this pistol is because it’s a Glock 19; arguably the best all-purpose handgun ever made. It is large enough to be a duty gun and offer functional accuracy and a substantial magazine capacity while being small and light enough for everyday concealed carry. Additionally, one cannot ignore the excellent record of reliability offered by Glock pistols. From my own experience, I’ve shot well over 100,000 rounds through Gen 3 and Gen 4 Glock pistols and the only malfunctions I’ve ever experienced were due to failed non-Glock replacement parts and a botched Cerakote job. With stock parts, a Glock pistol is near flawless in operation, even under harsh conditions. Specific to the Gen 5, you might consider the new Glock 19 for a couple of compelling reasons. First, the slide lock lever is now double-sided. So if you’re a lefty, switch the mag-release to the right and you have a fully-left-handed pistol. For those of you who like Glock pistols, but not the grip finger grooves, the Gen 5 comes with a flat-face frontstrap on the grip. No customization necessary. The Gen 5 brings very little that is new to the shooting experience, with 2 notable exceptions. The Glock 19 has always been a soft-shooting, easily managed pistol and it has always had accuracy that will outstrip 99.9% of shooters’ ability. What’s new to this experience is brought by the new Gen 5 barrel and the flat frontstrap of the grip. Having shot a lot with Gen 3 and 4 Glocks, I find the lack of finger grooves notable. I’m used to the grip snugging up to fill my strong hand and now it feels different. I don’t find the difference to be bad, but as the finger grooves fit my hand perfectly and I miss them on this pistol. I know a lot of folks have never liked them, so many will be pleased by this change. The Glock 19 Gen 5 after some muddy “wounded wing” training. It got dropped on the ground a few dozen times. The new barrel rifling profile is purported to double accuracy at longer ranges (4” groups at 50 yards, Glock claims). I’m not yet good enough to get 4” groups at 50 yards, but I did find that my groups at 25 yards were noticeably smaller with the Gen 5 as compared to my Gen 4 shooting. I can’t say for sure, but I’ll assume that this is due to the more accurate barrel. Glock added little ridges to the each side of the base of the polygonal rifling lands. 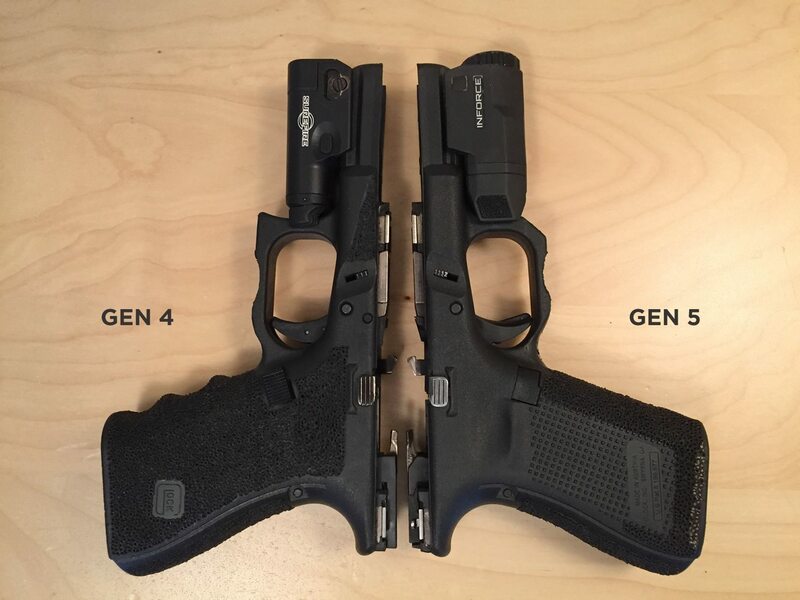 The Gen 5 trigger is perhaps a slight bit better feeling than the Gen 4, but it’s subjective and hard for me to tell. The Gen 5 trigger assembly is completely different from the Gen 4, configured like the Glock 43. It has a “New York” trigger spring that uses a polymer spring support and a compression spring (rather than an expansion spring hooking the bar to the cruciform). I tried a 3.5lb connector and felt no press-weight difference at all. So I tried a 2lb connector and got the 4.5lb press that I expect in my pistols. Interesting. The bulk of the 9mm ammo I’ve run through the pistol is 115gr ball, but I’ve run rounds from an assortment of Federal Premium 147gr Hydra-Shok JHP, Speer Gold Dot 124gr +P GDHP, Federal Premium 124gr HST JHP, Hornady Critical Defense 115gr, and Hornady Critical Duty 135gr …all with flawless performance. I have experienced none in ~4,000 rounds with my Gen 5 Glock 19. The only remarkable issue I can report is that inside of the first 1000 rounds I occasionally felt a slight hesitation as the action chambered the first round of a magazine. Instead of the standard “chick” sound/feel of the slide going into battery, there was sometimes a “ka-chunk” that felt like a slight hesitation with the round chambering. This anomaly went away after about 1000 rounds and never did impact the performance of the gun. Every round chambered and fired. As with every other Glock pistol, the Gen 5 G19’s trigger guard transition to the grip is quite angular and typically uncomfortable for the strong-hand middle finger while shooting. Therefore, I suggest that EVERY Glock pistol must have a Dremmel tool taken to the side and bottom of the trigger guard junction with the grip in order to create a smoothly rounded and reduced profile there. Other than this issue, the Glock 19 is plenty comfortable enough. There are some who disagree and find the G19 or any Glock pistol to be just fine without this slight modification work. With this modification I find the Gen 5 Glock 19 to be very comfortable. Without it, unusable. I, personally, would never own a Glock that had not been adjusted in this way. Sure would make for a nice Gen 6 upgrade. The Glock 19 is in no way snappy and it’s very easy for one to manage recoil. The location of the magazine release is good and I only have to modify my grip slightly to get my medium-sized hands into position to actuate it (as I do on every pistol made). Even with Glock’s minimalist slide-lock lever, my grip often interferes with the lever and I find that the pistol will not lock open on the last round of a magazine from time to time. This is in no way the fault of the gun. It’s all me. Even though it is a compact, the Glock 19 is larger than some in that classification. However, with a good and well-made holster, it is easily concealed in several positions on your belt, inside the waistband or outside. I wear a Glock 19 with a light in appendix position every day and never have a printing problem. Note, however, that concealability is managed significantly by the holster and its configuration. Most holsters made for concealed carry are made poorly are not configured to properly angle the pistol to aid in concealment. Be careful! 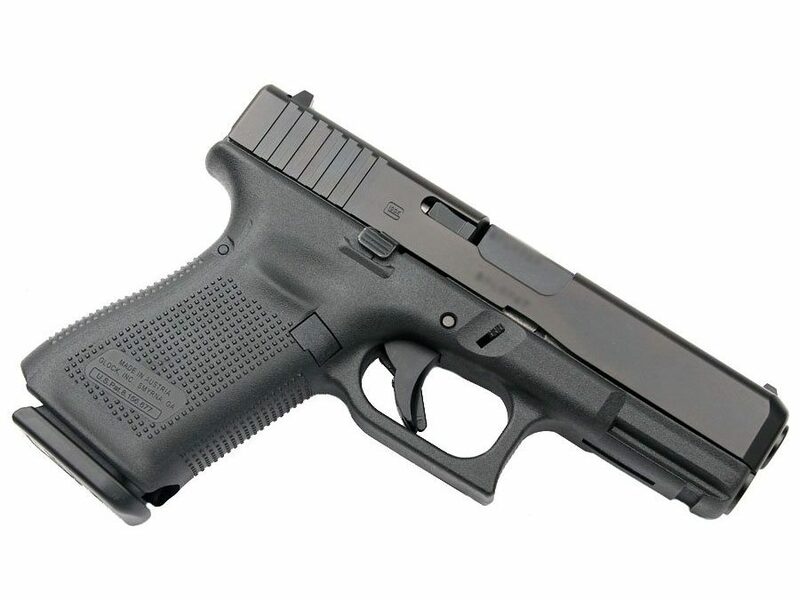 The Glock 19’s fifteen-plus-one capacity is ample, especially for a compact. It is no mistake that the Glock 19 sets the standard for size to capacity ratio in the pistol world. 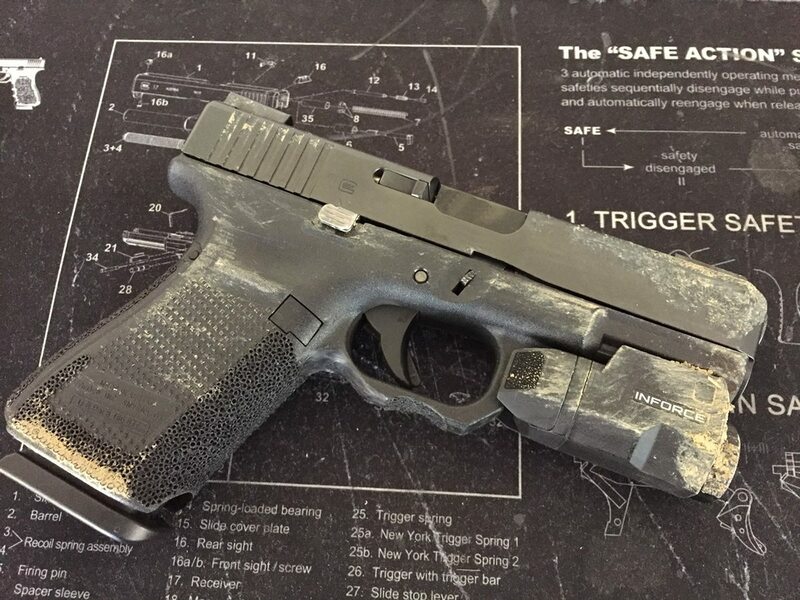 Scratches and flaked-off finish after the Glock 19 Gen 5 was dropped onto gravel repeatedly during training. The polymer frame is much like the Gen 4, except that the grip is slightly flared on the sides to imitate a magwell (it is only imitation) and the finger grooves on the frontstrap are gone. 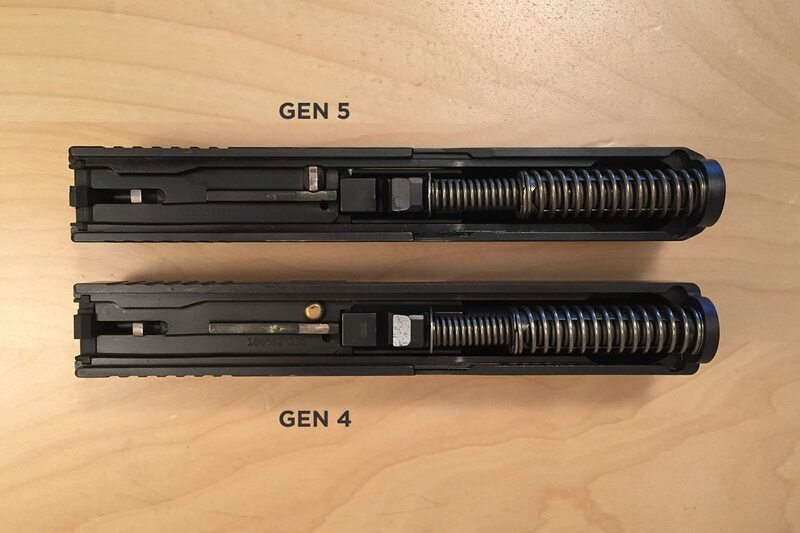 The Gen 5 also features only one pin near the locking block instead of the 2 pins common to recent generations. Perhaps because of this change, the frame is very slightly wider and very slightly taller than that of the Gen 4. 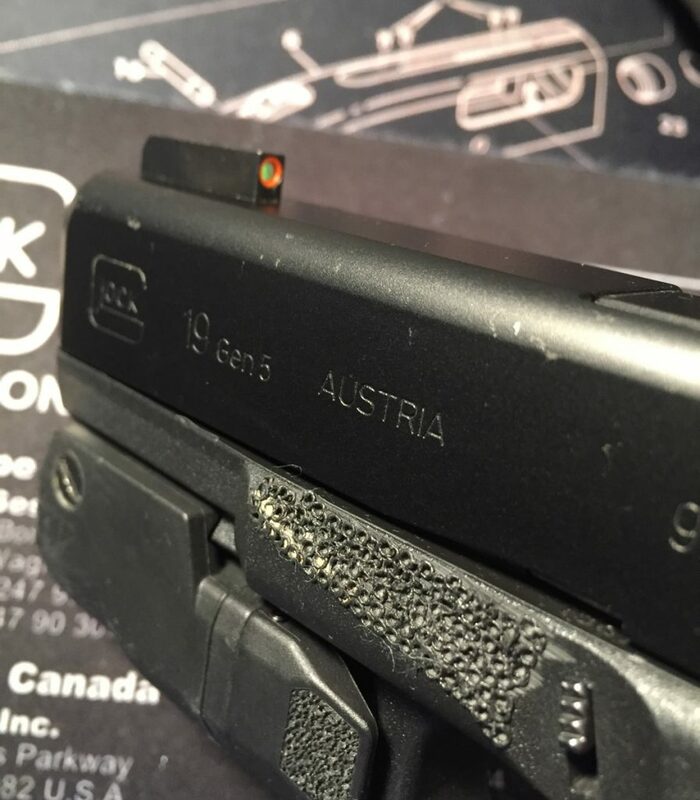 The grip texture is identical to the Gen 4 and is serviceable, unless you have wet or bloody hands (therefore, be sure to stipple your Glock if it is a carry gun). IF YOU CARRY A GLOCK 19 WITH A LIGHT, note that the Gen 5 with a light will not likely fit your Kydex light-bearing holster. The dimension from the top of the slide to the bottom of the accessory rail is slightly greater on the Gen 5 than with the Gen 4. This means that your gun will probably be too tall to fit into a hard (Kydex) holster with a light. It will likely take a short while before manufacturers are prepared to offer Gen 5 light-bearing models. The Gen 5 brought some changes that will for a while play havoc with some popular customizations. None of the previous-generation Glock OEM or aftermarket triggers will fit the Gen 5. The dual-sided slide-lock lever necessitates a reduced-size area on the top of the trigger shoe. If you like aftermarket triggers, you’ll have to wait until manufacturers release a Gen-5-specific setup. The very slightly wider frame means that the takedown tabs are ever so slightly more recessed than on previous generation models. Therefore you might opt for an extended slide stop with trapezoidal tabs. Note, however, that the slide-stop spring is no longer a leaf spring, but rather a traditional compression spring (which is very hard to install once disassembled!). The Glock 19 Gen 5 is a Glock 19, so it is the perfect combination of size and capacity. Some folks will like the absence of front-strap finger grooves. The nDLC coating delivers a better looking finish than that of the Gen 4. Like the Gen 4, the Gen 5 has interchangeable back straps. The Glock pistol is likely the most reliable pistol on the planet, and Glock claims the Gen 5 is the most reliable yet. Same old plastic sights, same old odd back strap shape. The slightly different frame dimension can present holster-compatibility issues is you have a mounted light. The new internals mean you’ll have to relearn some disassembly points and many aftermarket parts are incompatible with the Gen 5. This is an eminently shootable pistol. Controlling the recoil during shooting strings is quite easy. It is neither too big nor too small for precision manipulations and keeping rounds on target. The trigger is “fair,” but good for a Glock trigger. The Glock 19 is not the most ergonomically designed pistol, but with modification it has the potential to be quite nice. The lack of finger grooves will allow this version to better fit some folks’ hands. This is as good a shooter as most pistols, but the looser tolerances in the design mean that slight variations can creep into the results at longer distances. The new barrel rifling profile seems to more than make up for this beneficial flaw. There is no more historically reliable a pistol in the world. My only caveat here is that the Gen 5 is new and we have yet to learn of any inherent flaws or wear issues. The Glock 19 has been the most customizable pistol in existence. However, the Gen 5 presents us with some incompatibilities and new mechanisms that will require time for the aftermarket to catch up. Four stars instead of five here. The Glock 19 Gen 5 is in most ways, just another Glock 19, but there are some interesting and perhaps useful changes here. I can’t say that the Gen 5 changes are reason enough to replace your previous version, but if you don’t have a Glock 19, the Gen 5 model is well worth picking up. I like both my Gen 4 and Gen 5 Glock 19s and I look forward to seeing what the aftermarket manufacturers come up with in the way of augmentations and accessories. If you’re interested, but not sure if the Gen 5 if for you, rent one and put a few rounds through it. See what you think. Contemplating buying a Gen5. I really like the older Gen3’s because of the old finish. The Gen 4 finish is not nearly as durable. Do you think the Gen5 finish is as durable and Gen3? I really like the look and fact it’s a Glock! The look of the Gen 5 finish is fantastic and it is possible that it is more durable to normal wear, moisture, etc., but it is not so great at standing up to hard abrasion. As you can see in the photo of the finish in this article, the finish flaked off when repeatedly dropped onto gravel during training. My Gen4 Glocks, while they do get scratches, have not had the finish flake off like this when subjected to the same punishment. However, if you’re not going to make dropping your pistol a part of your training like I do, I’d tend to recommend the Gen5 finish. I paint my slide with CLP and let it stand overnight flipped over on the sights. All my Glocks have benefited from this, along with m6 new Gen 5. I replaced the factory mag baseplates with Pearce part number PG-G5BP: Enhanced baseplate for GLOCK Gen 5 M19,17 and 34 before I even shot my Gen 5. That fixed the cutout! Not if you add that notch on to the base plate to fill that void… you won’t be able to use that magazine with a Gen 4 any more. Maybe worth purchasing one for the main mag you carry in the gun but I wouldn’t put them on all of my mags. The new G19 gen 5 MOS pistol has that gap in the lower front grip addressed. It also has new front serrations on the slide and if you can either use or overlook the MOS part this might cover your objections. O/C it does cost more though. What type and brand are the sights that you have installed on the pistol in the picture? The front sight appears to be a combination of Hi Vis and night sight. Great article on the G5. The sights are Truglo TFX Pro sights.They are a combination of Tritium night sights with fiber-optic, and the front sight has the contrasting orange ring. I love ’em. Holsters weren’t a component of the focus of the article. I think it’s always a good idea to have a 100% Kydex holster of whatever brand and configuration you prefer. Leather and hybrid holsters are problematic for a few reasons, but with a Kydex holster I think you should get what you think is best for your build and concealment preferences. I wonder about the strenght of the 1 pin system. It is compulsory to replace the locking block pin every 20k-30k rounds anyway. Not something to worry about. Thanks, for the review. I am contemplating buying a new handgun and this review will help in my decision making. I have shot the Gen 4 Glock 19 at a local gun range and liked everything about it. Have not made a decision yet on whether to stick with the Gen 4 or go for the Gen 5, but now at least I have a better idea of the differences. For concealed carry, would you please compare the Glock 19 gen 5 ,9mm, with the closest model of the Springfield line, and give your evaluations. The closest model to the G19 would be the Mod.2, but there is a significant bore axis difference, with the Mod.2 having a higher bore axis. This offers more muzzle flip. It also has a longer grip and is heavier so it does not conceal as well as a G19. The G19 Gen5 (and G17) have been said to have problems with some of the existing holsters and the ambi slide release. Does the Incog Eclipse AIWB have this issue? No, the Eclipse has no problem with the Gen 5 (G19). I cannot speak to the G17 compatibility. Wondering if you found the added frame width incredibly noticable while carrying IWB vs the Gen4? No, I find the difference is pretty negligible. Really appreciate your comments and insight. I am a Glock fan as of late, having recently purchased a G43, and love it. I’d like to add a G19 to my collection next and have been contemplating a Gen3 vs. Gen5, as the local gun shops in my area are having massive sales on the older models by almost $200. Your article was thorough and thoughtful. Thank you very much! Great article, Thanks. So, here in Kalifornia, we are limited (regulated) to everything in life, including firearms. I love my G19, Gen3. My curiosity alarm went off when you were talking barrels. Is a Gen5 barrel compatible with a Gen3 ? My Gen 5 barrel works just fine in my Gen 4 (which is how I carry now). 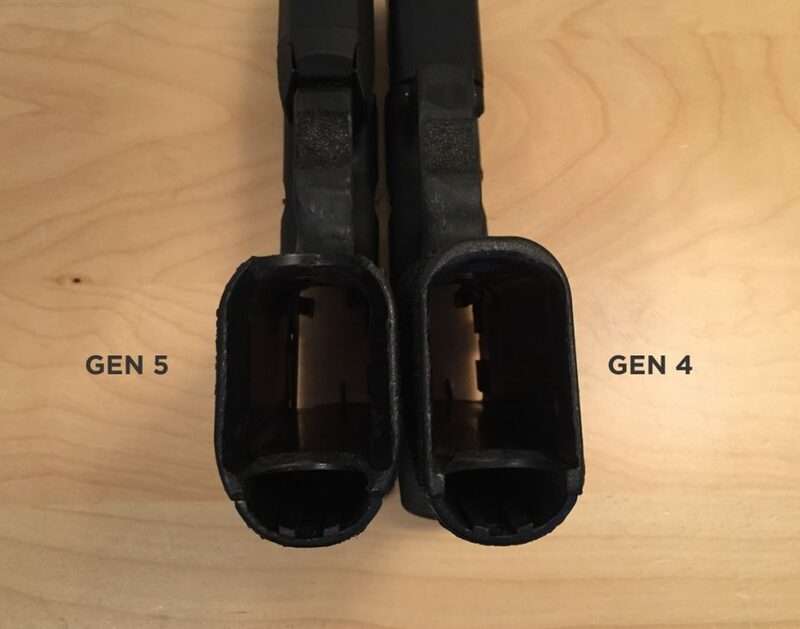 However, there is a difference in the barrel lug geometry between Gen 3 and Gen 4 and Gen 5. The Gen 4 and 5 barrels are milled to accommodate a different spring base (RSA). 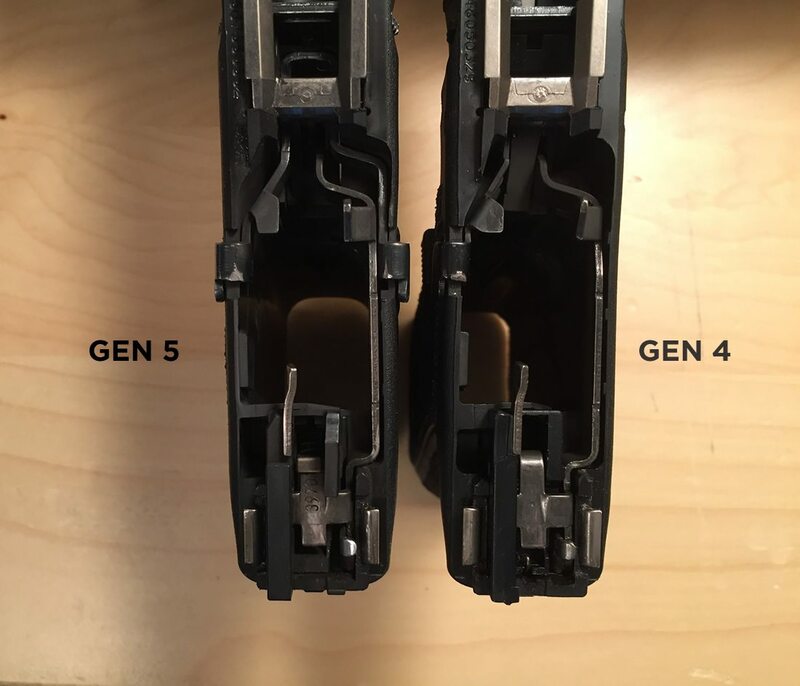 Glock says they’re not compatible, but some folks have done okay switching between Gens 3 and 4. I cannot offer any advice for putting Gen 5 into Gen 3 and would have to advise against it. “The Glock 19 has been the most customizable pistol in existence. ” You must be unfamiliar with the Model 1911 .45 ACP. Well, let’s be candid — there is no practical difference between 8 rounds and 15, granted that you have additional mags. Statistically speaking, unless you’re in a war-zone or in law enforcement, most defensive shootings end in less than 3 shots, though I agree with the importance of “overall capacity” — meaning how quickly you can send rounds down range, with and without reloads. However, the old adage holds true: it’s often not the number of rounds fired that wins the gunfight, it’s the number of rounds accurately fired. Vets from Nam can fill you in on that one. If you’re in a gun fight (as an average joe) and you’re shooting so fast that you can’t take cover, it may be a practical advantage. But if you’re not moving and utilizing cover, you’re also not likely to walk away from any prolonged confrontation, regardless of how many unshot rounds are on your hip or in your magwell. Also, magazine capacity also adds weight – a shifting weight at that – to your carry side. It makes balancing your carry more difficult (something that might seem small, but if you carry everyday for years on end, it is a big deal for hip and spinal health — appendix carry somewhat diminishes this effect, but not entirely). Lastly, duriblity is entirely subjective. If you’re daily and even ‘worse case’ scenario taxes your firearm to the point of either melting or breaking your firearm, then I’d reexamine your firearm usage philosophy (it’s not a hammer, though it is a tool, but it doesn’t need babying either). Where the Glock shines is ease of use, practicality, point-and-shootability, and as many point to, reliability. But let’s not allow that to mean that a 1911, in the hands of a well seasoned shooter of the platform can’t or won’t eat your lunch (so to speak). The 1911 has been and will continue to remain a very viable carry option. It’s slim profile makes it really shine for waste carry. For carry guns, it’s often width and length of grip that defines how well it carries. Modern manufacturing technology and materials have allowed to platform to evolve with the demands of users, though most 1911 guys prefer to stick with all steel models. The 1911 grip angle, slim grip, and often excellent trigger make it a favorite among novice and seasoned shooters alike. To be frank, I like them both. The only point of contention that I will acknowledge, aside from personal preferences, is that a 1911 is something that requires more training, so the user developes the proper muscle memory to swipe off the thumb safety either on the drawl or when presenting the firearm outward, depending on your training methodology. For me, I swipe on the draw, but that’s just how I’ve always done it. Also, and to be completely fair, I don’t pack a 1911 as much as I once did, but it’s because I’ve become accustomed to not fooling with a safety and prefer to have a cohesive mindset (across all carry arms). Since I carry a small handful of platforms throughout the year, I find consistency important enough to drop the 1911 from my carry rotation. However, that’s not to say that someone who only carries a 1911 is any less advantaged or disadvantaged — it all comes down to training and ‘good’ training, not just popping silhouettes on the weekends. But is it a “dinosaur”? Not hardly. We could move on the the caliber debate next, but that’s an entirely different ball of wax. Let’s just assume all of the mentioned above applies to (hold your breath 1911 enthusiasts) 9mm for both platforms. Your review just sealed my choice on a new handgun. I give it 5 stars! It’s past due time to replace my WWII Beretta M1934 and been considering the G19 gen5 even though the G19 is a bit bigger. My questions are, Is that the TG13GL1PC sights you are using? and Glock list the 9mm Luger – I am confused about the compatability of 9mm varieties. What works and what doesn’t in the G19 . The 9mm luger and 9mm parabellum are the same thing. Other 9mm rounds (Makarov, for instance) are not compatible with what are typically termed “9mm pistols.” The sights I put on mine, shown in the review are the Truglo TFX Pro sights. Hope that helps! 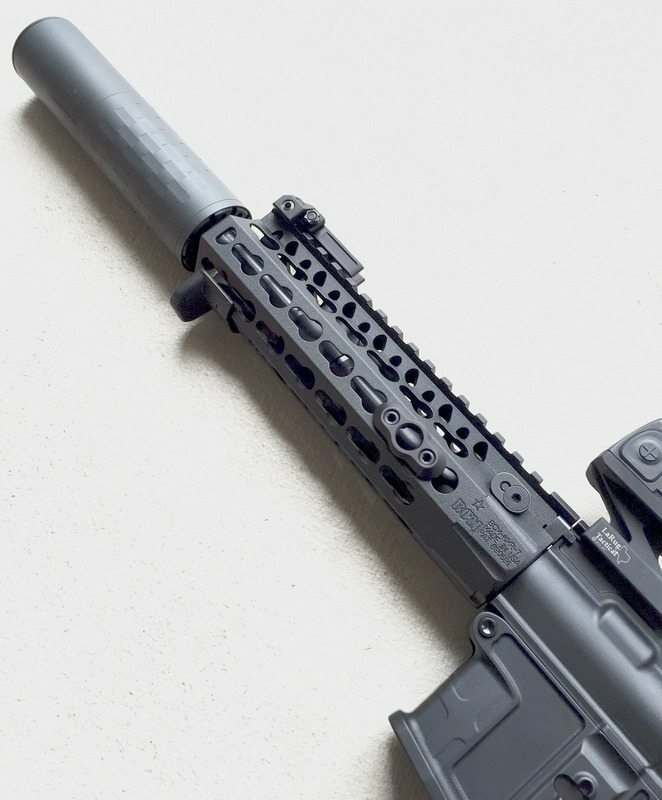 Will the reportedly tighter clearances of the marksman barrel have any effect on reliability. Would more frequent cleaning be required? I’ve been running the marksman barrel in my Gen 4 since the Gen 5 came out. I have had no change in reliability through all kinds of hard training (600-1000 rounds per week). With the tighter lockup, I do notice a bit more wear on the top of the barrel hood where it rubs the slide, but there have been no hiccups or catching. I don’t know (or understand) about the cleaning issue. 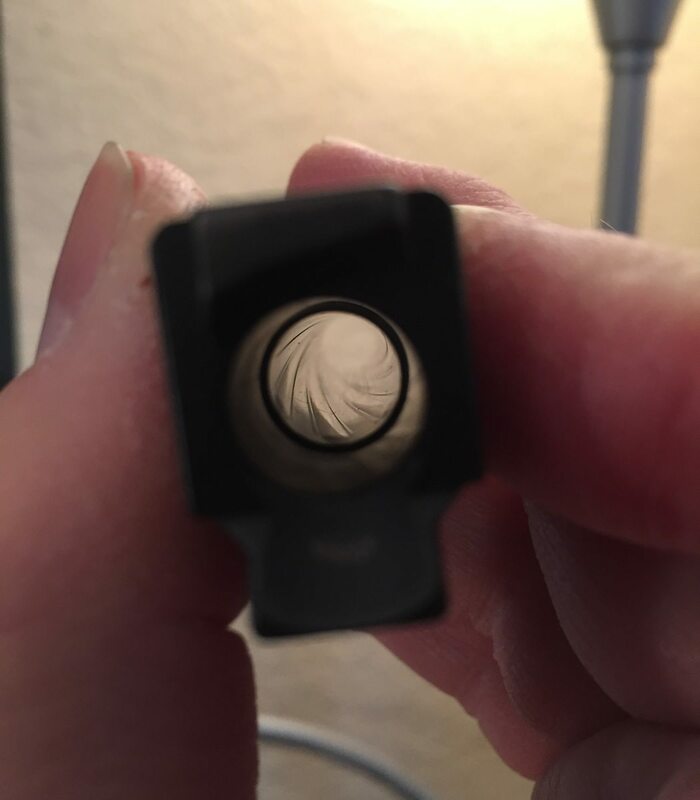 You should clean your gun every time you shoot it. I am new to GIOCK . I have the gen 5 19 . The blog you have is very informative thank you! Taurus my father-in-law convinced me to try Glock. A frend has a Glock 40 it was so nice barley any recoil. I hope the 19 is just as good. 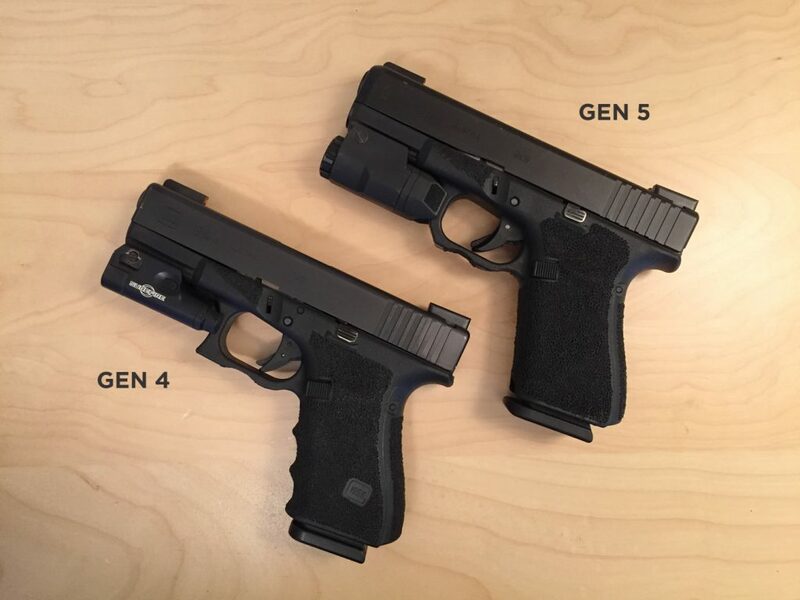 Is the g19 gen 5 handle longer than the gen 4? I’ve shot the gen 4 and my pinky kept falling off, very annoying. Thank you. I just purchased my first Glock, a G19 Gen 4. I’m 240 lbs and have large hands. Would the Gen 5 without the finger grooves be a better grip for me? I think that’s something you’ll have to discern for yourself. However, most of the folks I hear complain about the finger grooves have either very large hands or very small hands. So you might drop by a gun shop and give the Gen 5 a try to see how it feels. You mentioned a bad Cerakote job causing malfunctions. I’d be curious to hear how that happened, as I’ve considered getting a Cerakote job done on one of my Glocks. Thanks! I once bought a Gen 4 Glock 19 that was cerakoted, where the cerakote was allowed into the slide rails. This changed the tolerances and the friction coefficient while reciprocating and it was prone to not go into battery from time to time until I had about 2000 rounds through it, then all was fine. Cerakote should never be allowed inside the slide rails. Great info, thanks! Keep up the good work! Is the Glock 19 gen 5 a good choice for Home and Personal defense? What ammo do you suggest? Sure, the G19 of any generation is good for home defense. And so are lots of other quality pistols. For ammo, you want jacketed hollow points and there are plenty of good options. I’d recommend either Speer Gold Dot or Federal HST. There’s nothing I can tell to be concerned about regarding the trigger–unless you habitually modify the trigger or replace components to affect the action. The stock Gen 5 trigger is just fine, but it’s different in construction and components. No biggie. I have never owned a firearm and have been seriously contemplating purchasing a G19 for my wife and I. My issued weapon as a Navy Corpsman with the Marines was a Beretta 9mm which I last shot back in 1993. Will this be a decent forearm to “start” with or should I consider something different. I am planning on going through the training and getting a CCR for both my wife and I. In my opinion, there is no better handgun on the planet than the Glock 19. This is not to say it has the best of every feature or mechanism, but it is perfect in reliability, simplicity, and function and it has only what one needs and nothing one does not need…all while being the perfect size for either concealed carry or home defense. I’m a biased fan, but that doesn’t change the fact that any other pistol made by any other manufacturer will be lacking in one of these vital things. So I recommend the G19 over any pistol. Hello Andy… could you please elaborate a bit more on using a drummel to smooth out the tigger guard. Qué opinas de la pistola styer L9 A1 vs Glock 19 gen 5, Cuál me recomiendas para la defensa. Really like the detailed review of the Glock 19 Gen 5. Trying to choose between that, the 19x and the recent edition of the Springfield XD Mod 2 9mm. Tried them all and shot well with each. Any recommendations as far as which would be the best of these to get for a first gun? I am looking to up grade from Glock 26 gen 4 to the Glock 19 gen 5. How do they compare to each other? Are you a fan of the 26? I changed out the 10 round mags to 15. The G19 is larger–longer and taller–than the G26. The are basically the same width, however, and are in all other ways identical. So it depends on your needs and your purpose for this gun as to whether it makes sense to go to the G19. I am not a fan of the G26 simply because it is a less comfortable, shorter-barreled version of the perfect gun: the G19. Thanks for quick response and info. Will be going to the 19 very soon. Can you elaborate on using your dremmel tool to smooth out the trigger guard. You can find a comprehensive look at how I prepare all of my Glock frames here. I shot a Glock 21 gen 4 and a Glock 26 gen 5 at a range during “Glock Days”, both shot fine. However, my fingers stung while shooting both of them on my grip hand. I have no idea why. Till Glock fixes that problem, I would not purchase one. I have shot Sig’s, CZ, Smith and Wesson’s, XD’s without that problem.